temple adventure | Newlyweds in Charleston! There’s nothing like a one year hiatus! Whoop whooooop! I’d like to say I was super busy this past year, but I’ve mostly been content and lazy. We have now lived in Charleston for two years!!! I guess we aren’t really “newlyweds” anymore like my bio states. I’m still utterly in love with this city – and with my husband ha. However, I’m constantly at a loss for words when people ask me where to eat in Charleston. Um, genre? Price? Classic or trendy? Area of town???? Before I know it, I’m sweating with anxiety. Must. Give. Good. Rec. In summary, that question is starting to elicit the same response as when people ask me where to eat in New Orleans, the answer to which is, “How long do you have?? 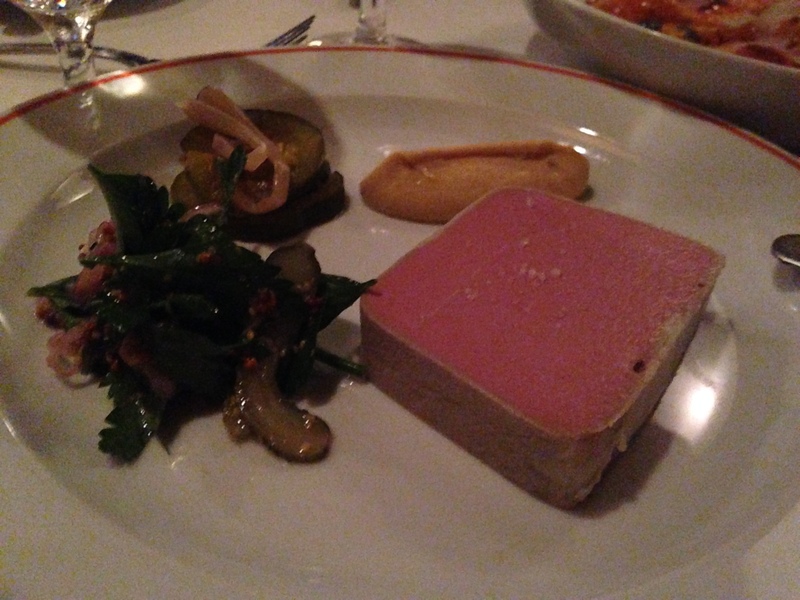 ?” This is further complicated by the crazy boom of restaurants in this city. The growth here (on every level – seriously, check out the housing market) is insane! Which means that when I go to The Eater Charleston hottest restaurants list, I usually don’t recognize half of the names. 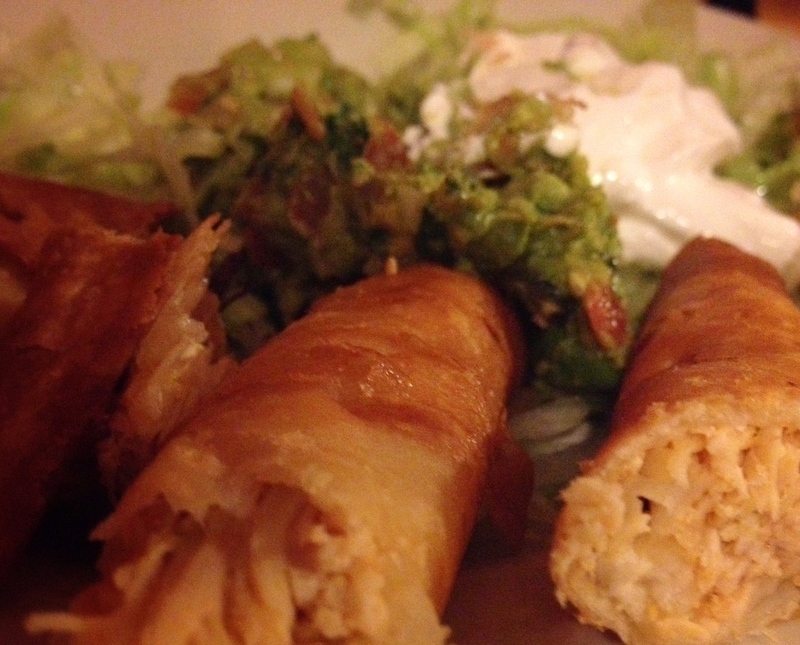 Well one of those names on the list (as of September 2015), I can totally recommend: Garcia’s Tortilla House. 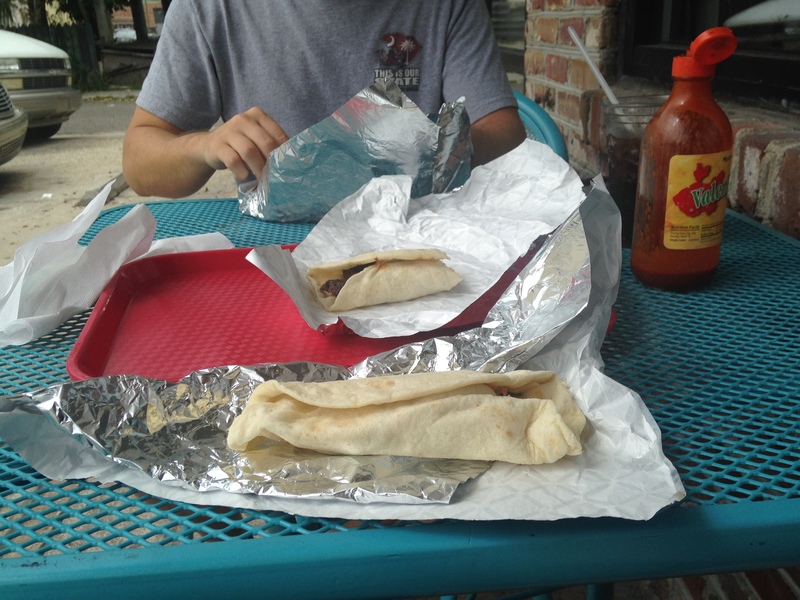 Garcia’s Tortilla House – Fancy level: crazy casual/sweatpants acceptable; Money: $20 dollars for two people’s tacos! ; Ambiance: I just said you can wear sweatpants, so you can guess. Geoff and I take Mexican food pretty seriously. It’s our usual go-to after we spend an hour discussing other options. 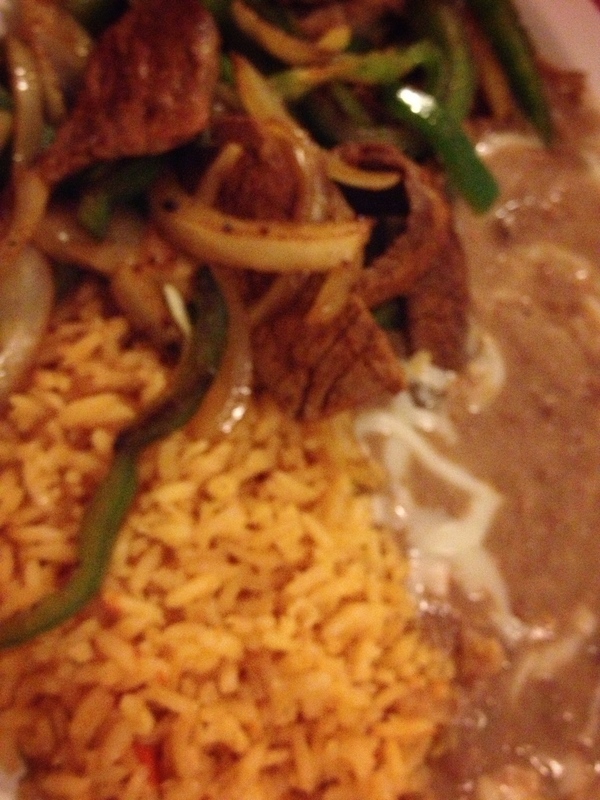 I’ve said it before, and I’ll say it again – give me cheese and refried beans and I’m pretty much a happy camper. Well, lately, I’ve found I have a wee bit of a dairy intolerance. Also, some new study told me it’s NOT healthy to consume 1 pound of liquid cheese in a sitting. Rude! 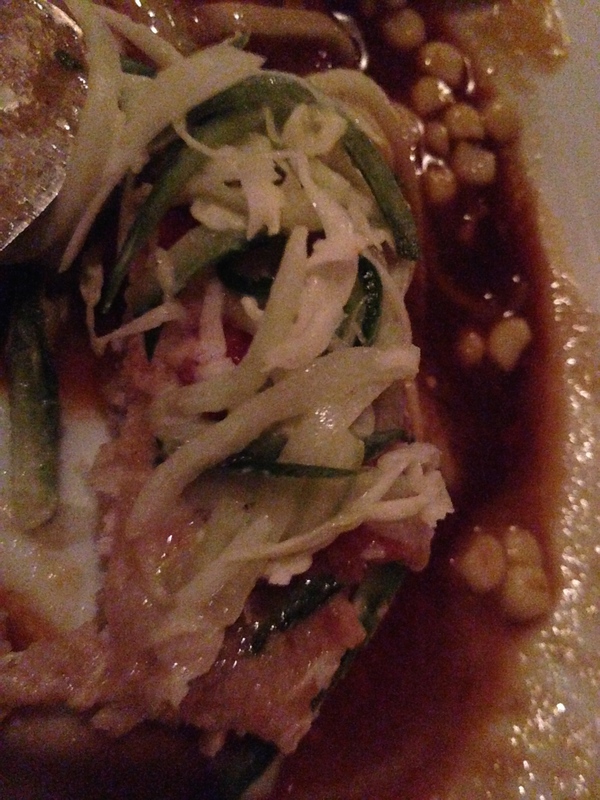 My one pic of our tacos looks pretty sad – but tacos are hard to photograph, people!!! We got two of their specialty grouper tacos and one carnitas taco with refried beans, grilled veggies, cilantro & onion. My ONE regret is they don’t have legit hot sauce – at least have a good selection if you don’t have a homemade one. They had Valentina only. Next time, I’ll be bringing one from our collection at home —- we LOVE hot sauce. I got a definite family feel at this restaurant. As in, the worker could answer all the questions I asked and also openly encouraged us to come back. They are new, and though they are on the hot list, we all see a lot of restaurants here that don’t make it. I sure hope they do! And if I must eat tacos to support the local economy, that is a cross I will bear. This is the best and easiest cheesecake recipe ever. I’ve made it a few times, and it is always a hit. When Geoff and I were dating, he said he liked cheesecake. So I started looking at recipes. When I come across words like “water bath,” I almost scrapped the whole thing. But then I found this one which looked too easy to be good, and it was delicious! I love the tartness of the lemon and the sweetness of the blueberries. It is just the perfect refreshing little dessert snack after a big meal. Ok, they may not be the prettiest bars, but I am not a pretty cook. We know this. 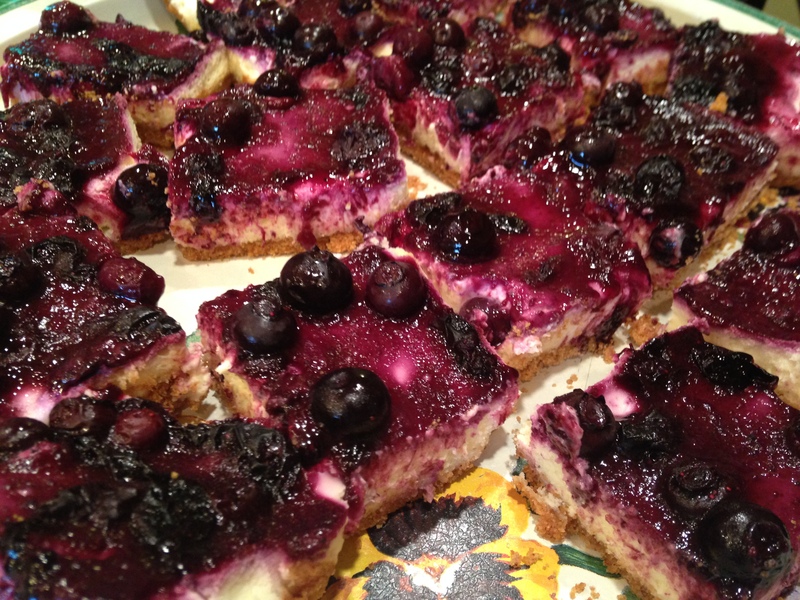 If you want a prettier bar, skip making the sauce and just put the blueberries on the cheesecake before baking, as shown in the link listed. I wanted there to be more of a blueberry flavor, so I opted for a sauce. Preheat oven to 325 degrees. Grease the bottom of a 9 by 9-inch baking pan with butter. Then place parchment paper over the top, pressing down at the corners. In a food processor, process the sugar, cinnamon and graham crackers until you have the consistency of breadcrumbs. Add the melted butter and pulse a couple of times to fully incorporate. Pour into the lined baking pan and firmly pat down with the bottom of a glass. Bake for about 12 minutes, or until set. Add cream cheese, eggs, lemon zest, lemon juice, and sugar to the food processor and pulse until well combined. It should have a smooth consistency. Pour onto the cooked graham cracker base. Bake in the oven for 35-45 minutes, or until the center only slightly jiggles. In the meantime, heat your blueberries in a saucepan over low to medium heat. Once warmed, smash around half of the blueberries, leaving the remaining ones intact. Once your cheesecake is done, remove it from the oven. Let cool slightly before pouring your blueberry sauce on top. Then, let your cheesecake come to room temperature and then refrigerate it for at least three hours. Once set, remove from pan using the parchment lining and slice into bars. I’ve been sitting on a faux boiled crab recipe that I got from my cousin Lisa for about a year now. Why did I wait so long to make these??? 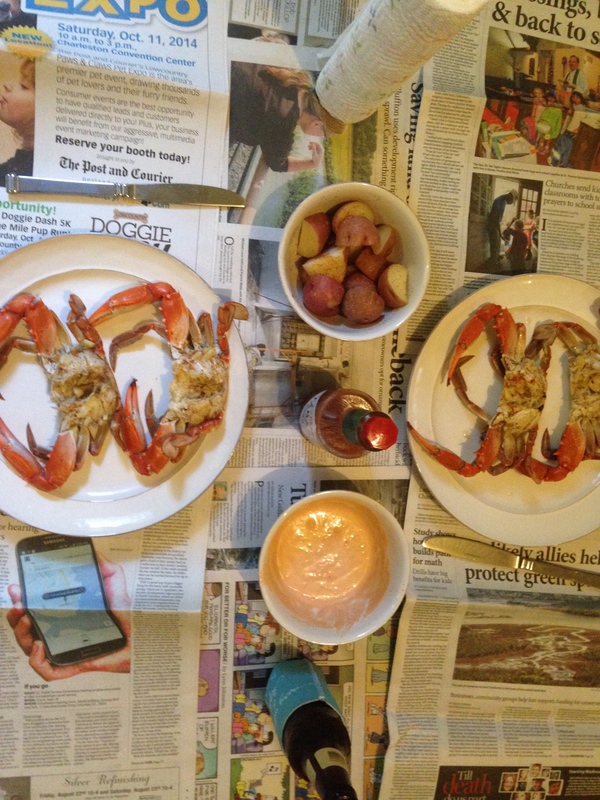 By faux, I mean you don’t have to go outside and have a big traditional crab boil. You can cook them inside, with minimal fuss and cleanup. Another perk? They are even BETTER than traditional boiled crabs. This is because you take the shell off the crab before you cook them, allowing the crabmeat to soak up butter, garlic, and seasoning. 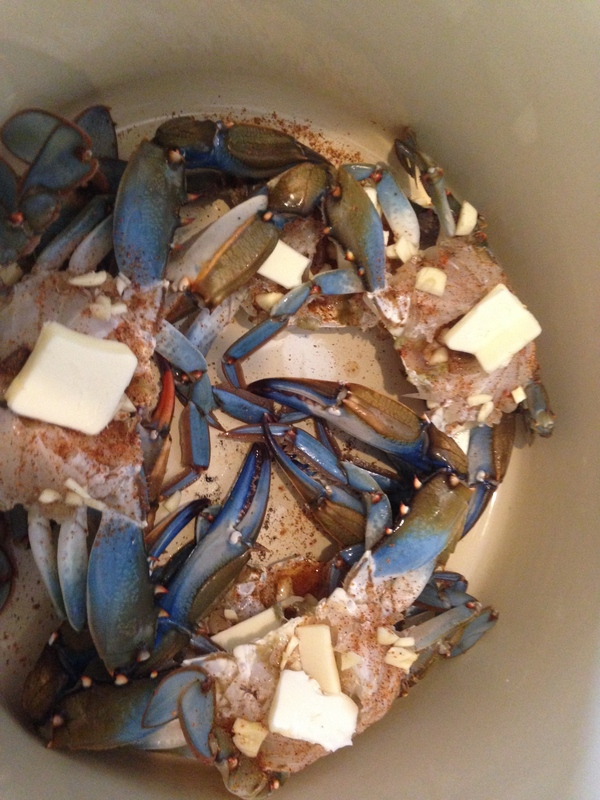 These crabs reminded me of delicious French mussels, but even better because of the blue crabs! I made the traditional South Louisiana dip that is always made for crab and crawfish boils. Combo of ketchup, mayo, horseradish, lemon, hot sauce, worcestershire sauce, and maybe some other things I’m forgetting now. Anyway, the crabs were so good that the dip was just a bad idea (except for potato dipping). You don’t need, and shouldn’t add, anything to these delicious crabs. Has it been adequately conveyed to you that you HAVE to make these crabs??? 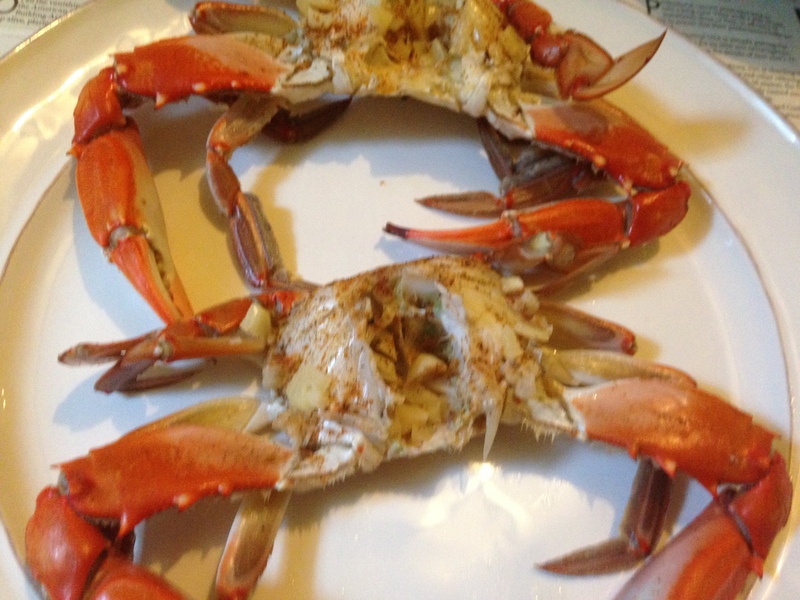 You can make as few crabs as you want (I made only 6, which I most regretted) up to 2 dozen. In making a smaller amount, I lessened all the ingredients except the beer. Chill crabs on ice so they do not pinch you while cleaning them. Take off top shell and take the lungs out and spray off all the guts out of the crabs. I did not like the “killing” part of this recipe, so Geoff took over. You’re going to need a fairly big pot. 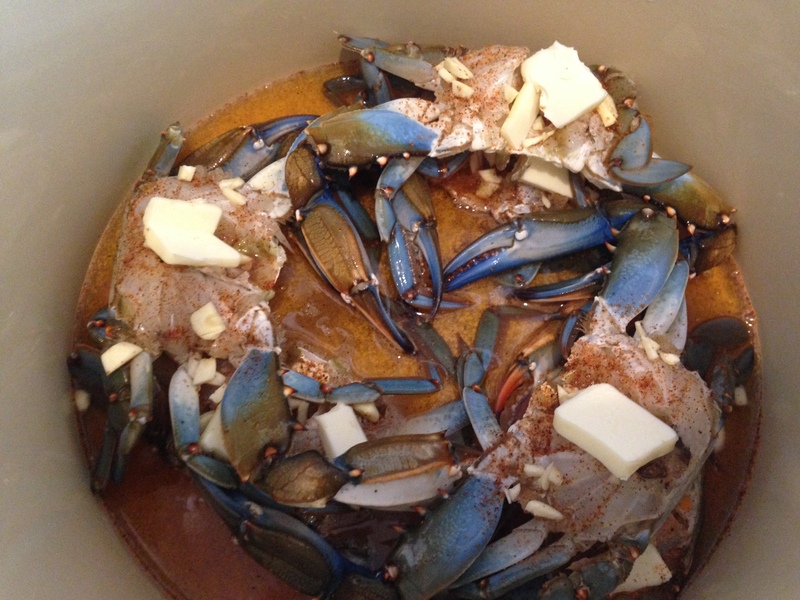 Make first layer of crabs around the bottom of the pot and sprinkle with Tony’s and slices of butter and garlic. 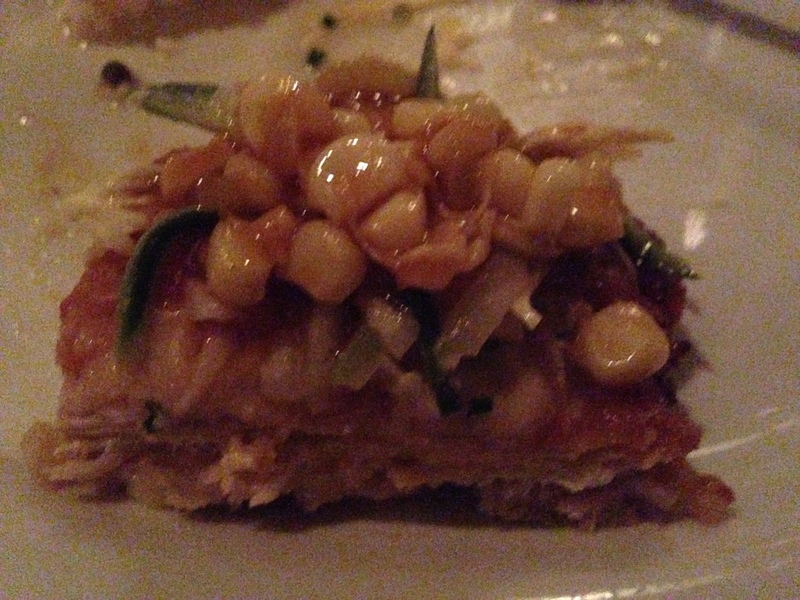 Make another layer of crabs on top of the first layer and again sprinkle with Tony’s and slices of butter and garlic. Continue making layers until all the crabs are in the pot. 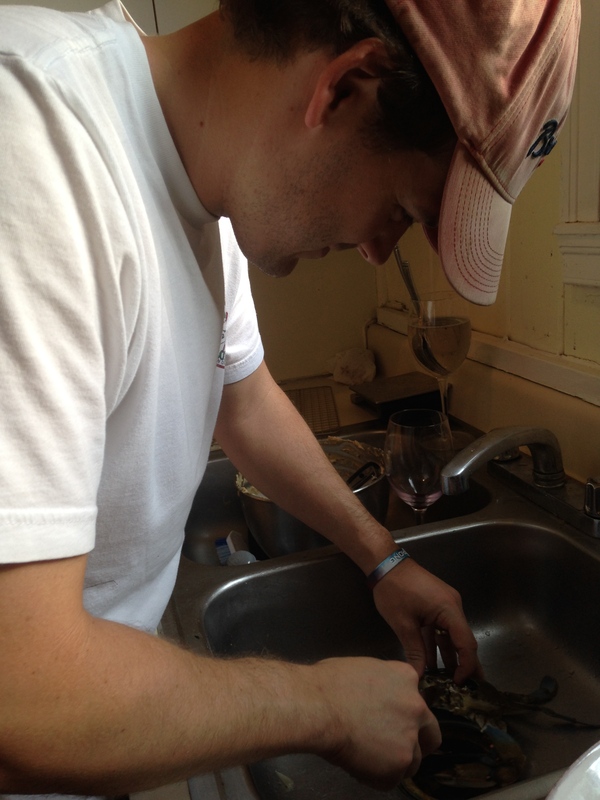 Take 20 oz of beer and pour it around the edge of the pot so the Tony’s seasoning doesn’t get poured off the crabs. You can sprinkle more seasoning after pouring the beer if you think some of it washed off. Cover the pot and cook on medium to high heat until you see steam coming from the pot. Once you see steam coming from the pot, set a timer for 5 minutes. Once the 5 minutes is up, they are done and ready to eat! I served it with boiled potatoes (just quartered red potatoes boiled in crab boil and seasoning) and beer! I actually made this for my birthday dinner and this meal was oh-so-worthy of the honor. 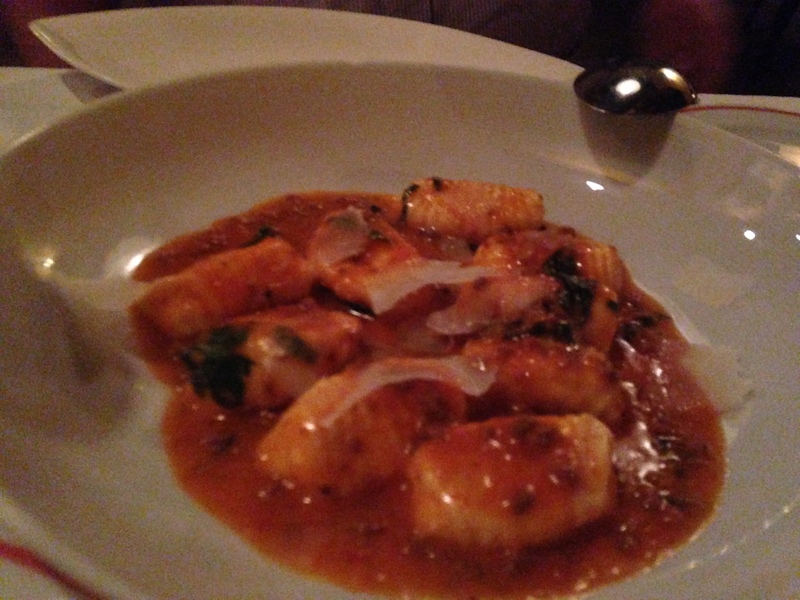 I FINALLY got to eat at FIG last weekend when my parents came to town (read: they were footing the bill). It only took me a year of living here. It was worth the wait. 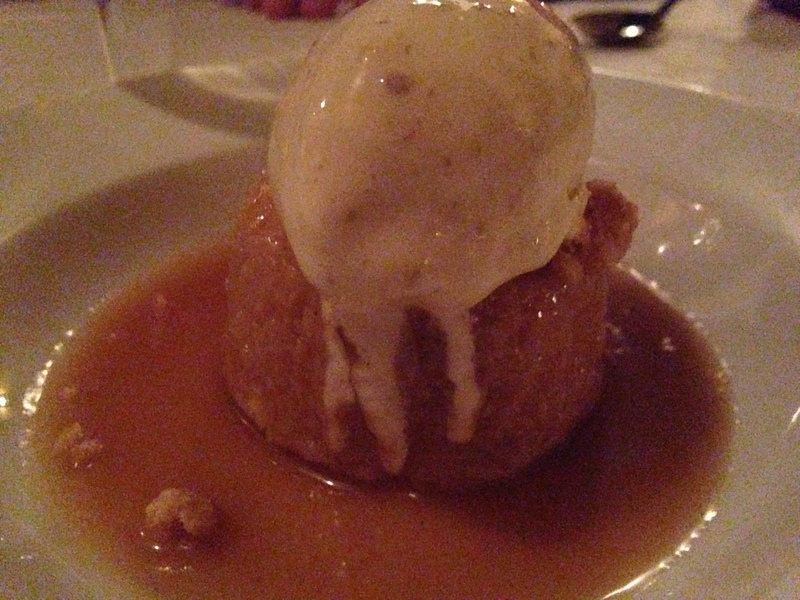 Everything – the food, the waitstaff, the ambience – was perfection. FIG stands for Food is Good and, boy, was it ever. We opted to get 4 appetizers, 2 main dishes, and a dessert. For round 1, we got the nine vegetable salad, the tomato tart tatin, chicken liver pate, and ricotta gnocchi with bolognese. 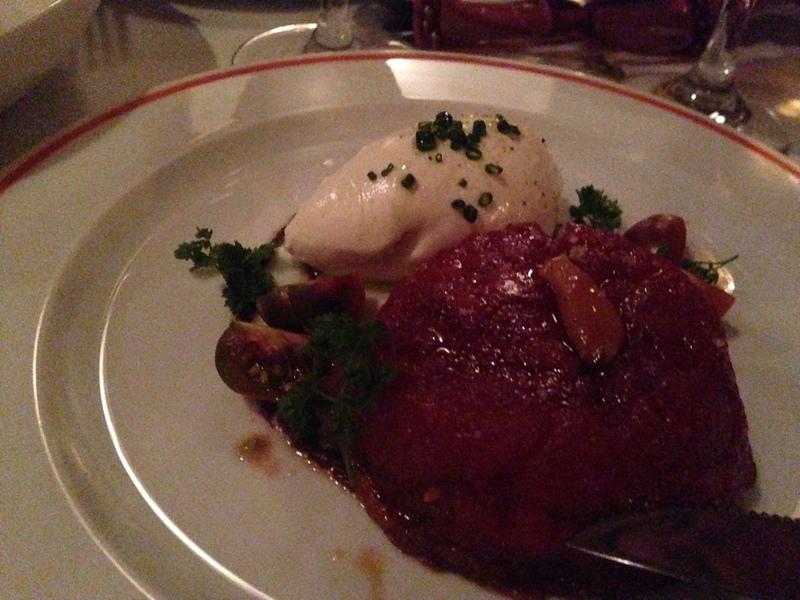 They were all delicious, but the tomato tart tatin and ricotta gnocchi were especially scrumptious. The tomato tart didn’t look all that appetizing (kind of like a giant beet) but oh man it was awesome, and it came with a light goat cheese that tasted whipped. 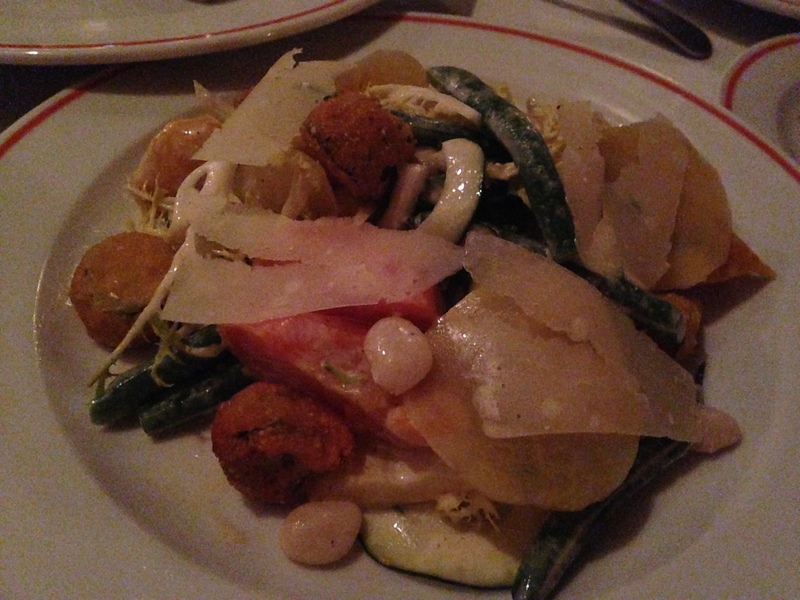 I did wish the dressing on the vegetable salad was a little lighter, like a vinaigrette. For our main dishes, we got the mustard crusted swordfish and the pork schnitzel. I was looking forward to the schnitzel mostly, but the swordfish stole the show. It was awesome. The schnitzel was flavorful but wasn’t really a schnitzel (too thick). The potato puree served with the swordfish was to die for. Now, for dessert. Normally, I’m not a big dessert person, much to my mother’s horror. I would prefer to ask the waiter for another bread basket and butter. (BTW FIG gets their bread locally from Normandy Farm Bakery, and it was delicious.) But when we heard this dessert option, we knew we had to try it: vanilla malt cake topped with roasted banana ice cream and buttered rum. OH MY. This was the best thing we had all night. Coming from a non-dessert person, that’s high praise. Mom, if you are reading this, have you emailed them for the recipe yet??? All in all, this meal was perfection. We spent a few hours here and were not rushed at all. We had delicious cocktails, some wine, and after dinner drinks. Then, we went home to watch our LSU Tigers win! Perfect night. Here is a pic of my darling parents. 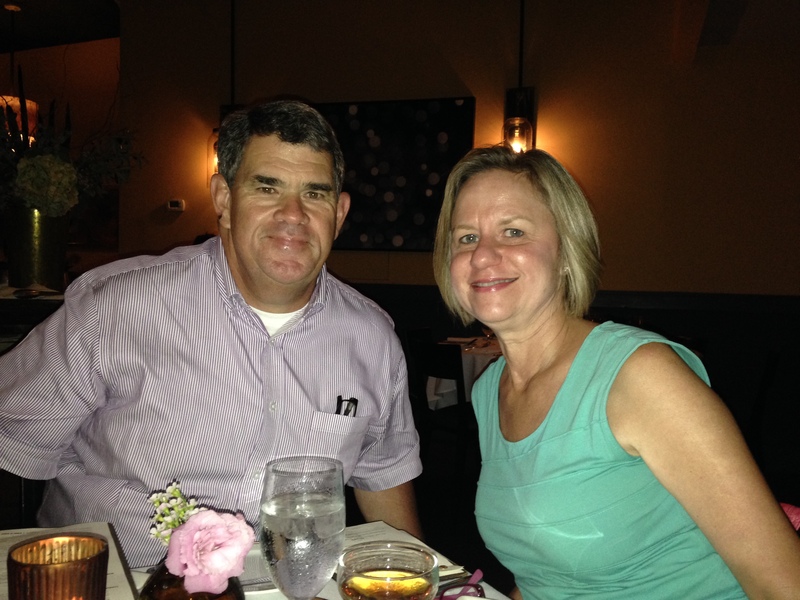 FIG will now be my top recommended spot for anyone looking for fine dining in downtown Charleston. Is Lee Lee’s Kitchen Hot… or not? I’m sorry, I have a lame sense of humor. BTW, the answer is NOT. Lee Lee’s is a new-ish Chinese restaurant near the Citadel. We have tried it twice, and both times we left literally saying, “Blech!! !” I insisted we try it a second time because I had heard such great things about this place – they got rave reviews from week one of opening. Perhaps we ordered wrong? Round 1: we got the Sichuan wings and ginger beef. I can’t thoroughly describe these because it was awhile back. When I asked my husband if he remembered what they tasted like, he responded, “No, I tried to block that out.” I do remember the wings having a strongly unpleasant taste. Like, I couldn’t eat them. And that never happens. I also remember that for the shared main course, we were left making our own sad little mix of white rice, soy sauce, and chili paste (the last two of which we had to ask for just to import some flavor other than ginger). Round 2: we got the wonton soup, crab rangoons, and salt and pepper calamari and shrimp to share. First two were very average, if not below average. And we ain’t picky about our rangoons! For the main dish, we knew we would get this before we arrived because the waitress on our first visit said it was the best dish on the menu. God, I hope she was wrong. They had options of salt and pepper shrimp OR salt and pepper calamari. I asked if we could get both. Waitress said yes, failing to advise of the significant upcharge. Then the dinner arrived. I almost laughed. It was heavily breaded, deep fried seafood with no sauce. Literally what you would get if you ordered a seafood platter at a seafood restaurant, minus the delicious fries and tabasco. So we had (yes, they were salted and peppered as the name suggested?) fried breading and white rice. We found ourselves, again, requesting soy sauce and chili paste for sad “stir fry.” I picked out the few sautéed peppers/onions and wouldn’t eat more of the seafood. Again, a meal I wouldn’t eat. I think the only two times this has happened in Charleston were both at this restaurant. Sorry to give such a scathing review, but it was just so bad. Even the hubby said, “I want to go write a review for this place!” All indignant-like. He so cute. 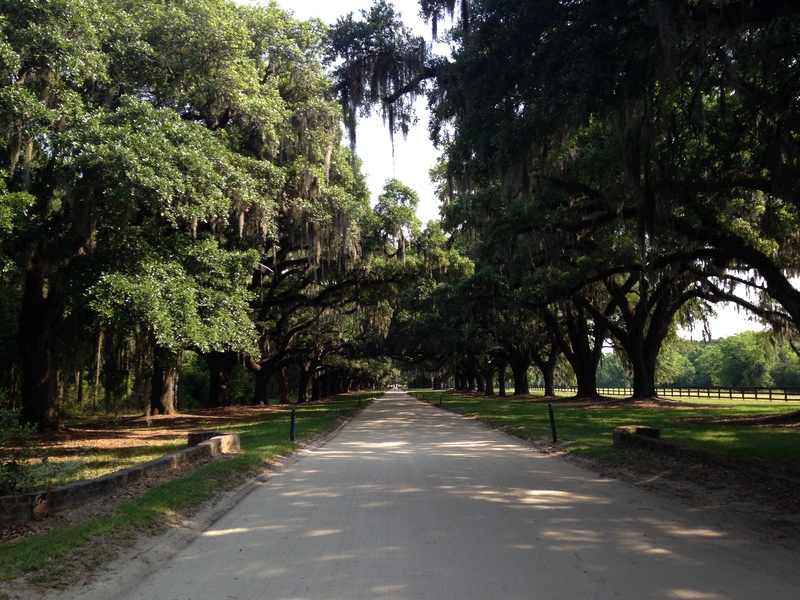 I’ve lived here over nine months and still had not made it out to Boone Hall Plantation. There are a lot of events held there, but I really wanted to devote a day to just exploring the grounds. When I made a new Australian friend at the local laundromat (yes, I am very random) and heard she wanted to head out to the plantation in Mount Pleasant, I decided to tag along. Best decision. Though the house was quite small for the plantations I’m used to, the grounds were just stunning. Overall, it was a great bang for you buck, too. You pay $20 to get into the grounds. However, you can take up to four different tours and wander the grounds til you drop. 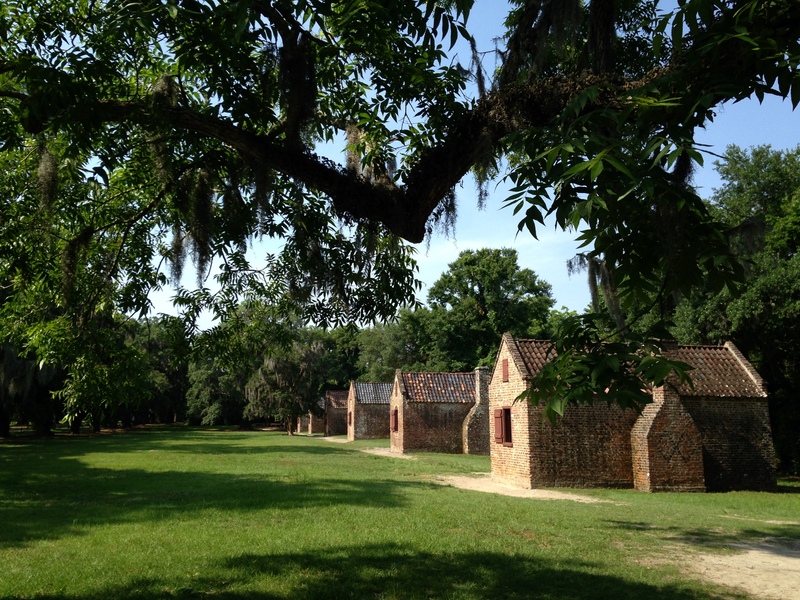 The guided tours include a house tour, a slave street history tour, a bus tour of the grounds, and a gullah culture tour. 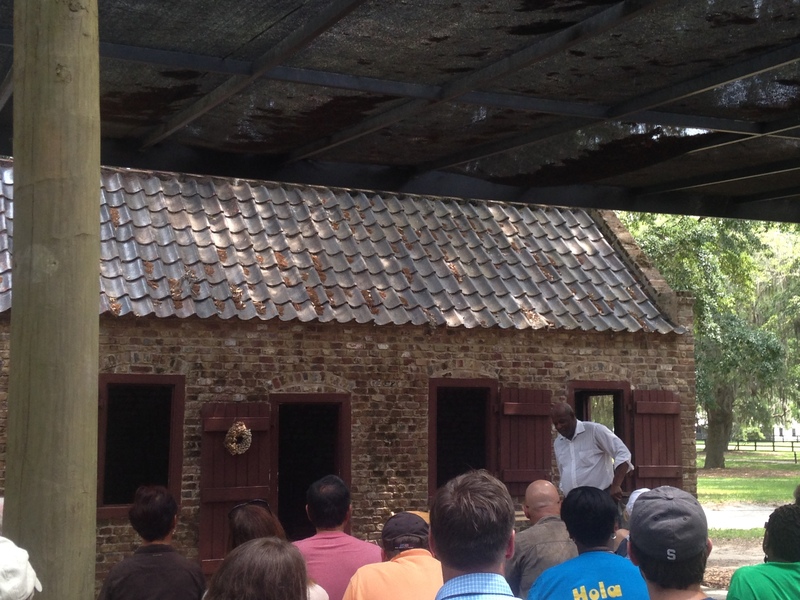 The Gullah culture tour was truly fascinating. 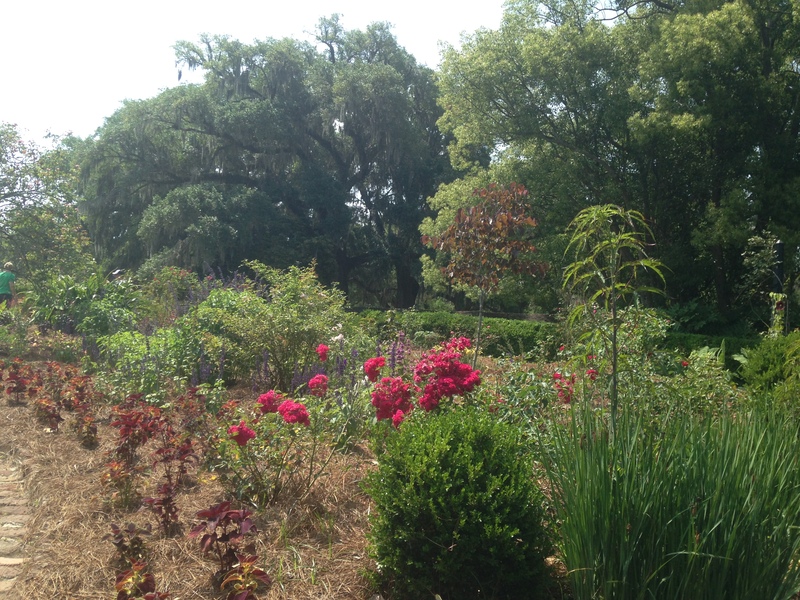 Gullah is the term for the descendants of the slaves from the Lowcountry. 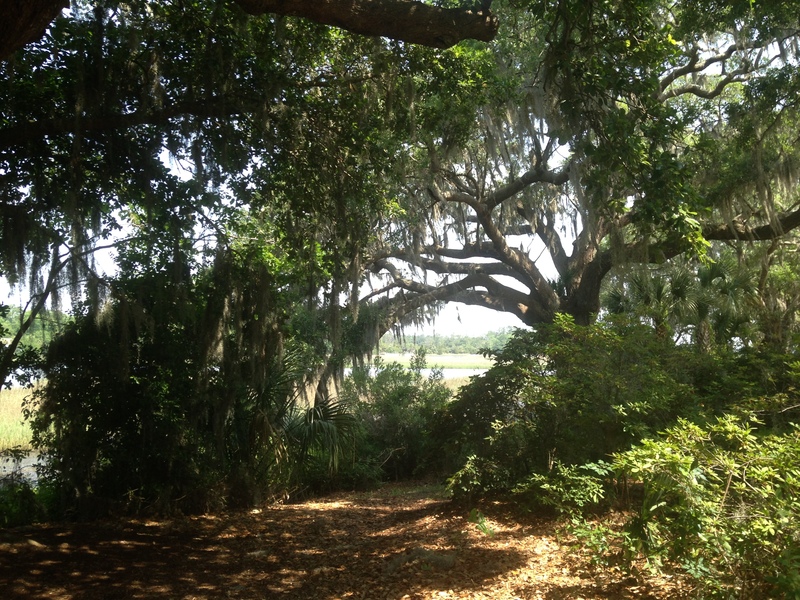 An old man sang Gullah songs for us and recounted the history and customs of the Gullah people. I want to be his friend. Here are some other pictures of the grounds. I would go so far as to say this is a must-do on your visit to Charleston. Downtown is awesome, obviously, but you should get away to the quieter parts of the area and to learn about the history of this home. 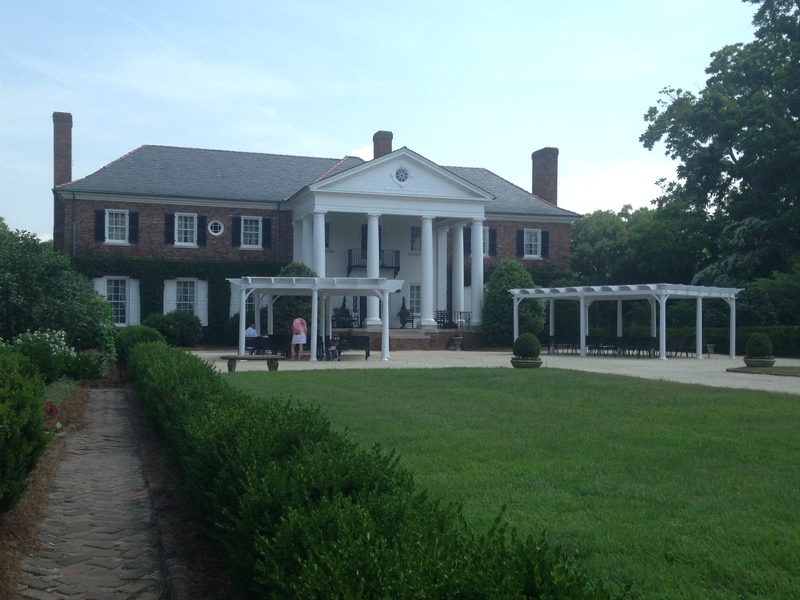 Also, for your pop culture enthusiasts, parts of The Notebook were filmed here, and this plantation is where Blake Lively and Ryan Reynolds were married. Geoff and I went on quite the trek for a good Mexican place we hadn’t tried. (Speaking of Mexican in Charleston, I’m pretty sure Juanita Greenbergs food-poisoned us.) We found this place based on reviews, and it is really far into Mount Pleasant. It took us half an hour to get there from DT Charleston. Worth it? Yep. It is called Carmen y Juan but was apparently formerly known as Los Compadres – so different sites list it by different names. It is in a little strip mall in a neighborhood. We got a bit lost. Call it Carmen y Juan or Los Campadres, it is run by the most friendly people!! Really makes you want to support local businesses and small businesses. One of the owners (I’m not sure which one – apparently it is run by two friends) was working the kitchen. The owner’s son, a pre-teen (? I’m not good at guessing kids’ ages), was our waiter. Um, he was super cute and a good little waiter! He eagerly told us his favorite things on the menu and was very attentive. We also shared the Steak Fajitas, which were excellent. Plenty of food for two! Probably too much – we planned on going to a movie after, but I wanted to lie in bed in sweatpants instead. Maybe next time. This is the kind of place you really root for. It was obvious that the owner knew his regular customers. And the food is delicious! !